Within the field of psychology, a revolutionary paradigm shift known as ‘positive psychology’ is redirecting the attention of researchers to the positive. Shifting away from the lugubrious ‘DSM IV mindset’ which focuses on disease and illness, the new paradigm turns instead towards inspiring stories of human flourishing. In the new paradigm, focus on e.g., the connection between addiction and poverty is replaced by a focus on character traits – such as resilience and optimism – that have enabled some to transcend their inauspicious conditions. The time is ripe for discourse on International Justice (IJ) to experience a similar paradigm shift. Naturally, discourse on IJ tends to be dominated by stories of atrocity. IJ is concerned with the development and implementation of mechanisms (criminal prosecutions, truth commissions) aimed at redressing state sponsored horrors. The hope is that these mechanisms can help to heal the wounds inflicted by such outrageous harms and, ultimately, construct a substantive notion of human dignity that is realized both in state practice and in ‘the small places close to home’. It is in this domain that we encounter the meme of ‘Truth and Memory’ (T/M). In its present mode, IJ tends to interpret T/M through a narrow lens, focusing on the abuses, violations and the public’s understanding of these harms. T/M initiatives are concerned with deepening the public’s understanding (Memory) by preserving and communicating (Truth) about human rights violations, usually via state-sponsored truth commissions. As important as it is to note, name and record such violations, it is imperative for IJ to link its concern with Truth and Memory to positive stories of accomplishment and hope. A rich source of inspiration for IJ is the 19th century peace movement which led to the Hague Peace Conferences of 1899 and 1907. Why? 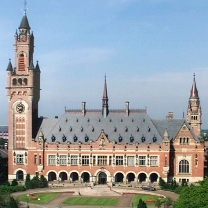 These conferences marked the first time that the international community and an organized, mobilized public worked together to build an international institution aimed at ending war: The Permanent Court of Arbitration. This achievement was so extraordinary that Andrew Carnegie, a private U.S. citizen, donated 1.5 million dollars to give, in his words, this ‘High Court of Humanity’ a proper, symbolic home. Known today as ‘The Peace Palace’, this poignant symbol of optimism and faith in humanity is located at 2 Carnegieplein (Carnegie Place) in The Hague, Netherlands. Unfortunately, few people know this story. Consequently, few understand this story about how the U.S. government worked with the private sector and with educators to realize –for a moment- the pacifist vision behind the 1899 Hague Peace Conference. Nor is it widely known that the 1899 Hague Peace Conference was so momentous to the U.S. that it inspired a state-sponsored program of peace education. Inspiring stories such as these should be part of our ‘collective memory’ for they, too, have a role to play in fostering true healing and, possibly, the construction of a substantive notion of human dignity that is realized in both state practice and in the small places close to home.